HABITAT VALUE: The confluence of these two channels is a peninsula largely inaccessible by foot because of the Marina Freeway. 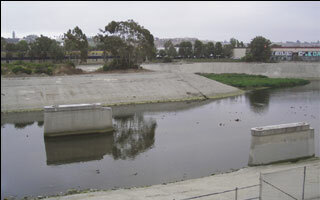 It would make an excellent site for restoration of riparian vegetation that might continue up Centinela Creek between the channel and the freeway. This site is would be an ideal loafing spot for waterbirds, it could be greatly enhanced through restoration of riparian vegetation.